While touring a client’s facility, representatives of Eagle Precision Cast Products noticed a cable clamp assembly–a relatively complex fabricated part that they believed would be an excellent candidate for fabrication to casting conversion. The cable clamp that Eagle reps noticed was a hard-working part. It was responsible for holding underwater communication cables in place for off-shore oil rigs. Reduction of client manpower: Eagle Precision’s process delivers a finished product, whereas previous methods require the client to finish in house. Reduction of machining requirements: Investment casting is able to produce parts that meet tight tolerances, often reducing or eliminating the need for machining. Reduction of part weight: Cast parts can be efficiently designed to eliminate excess material, reducing overall part weight. Reduction of lead times: Investment casting’s dependable, repeatable process allows for shorter, more dependable lead times throughout production. Improvement of part consistency: Fewer variables in the casting process lead to enhanced part consistency, as do quality-control measures employed by Eagle Precision. Enhancement of part strength: Precise design and elimination of weld points contribute to an overall stronger part. Enhancement of part aesthetics: Investment casting allows for curved edges, smooth finish and unique, one-piece designs that can proudly display company names. Before beginning production, the client needed to make sure they would be getting a cast product that worked just as well as, or better than, the fabricated version. For the design stage, Eagle Precision Cast Products offered casting and machining drawings on an hourly contract basis. 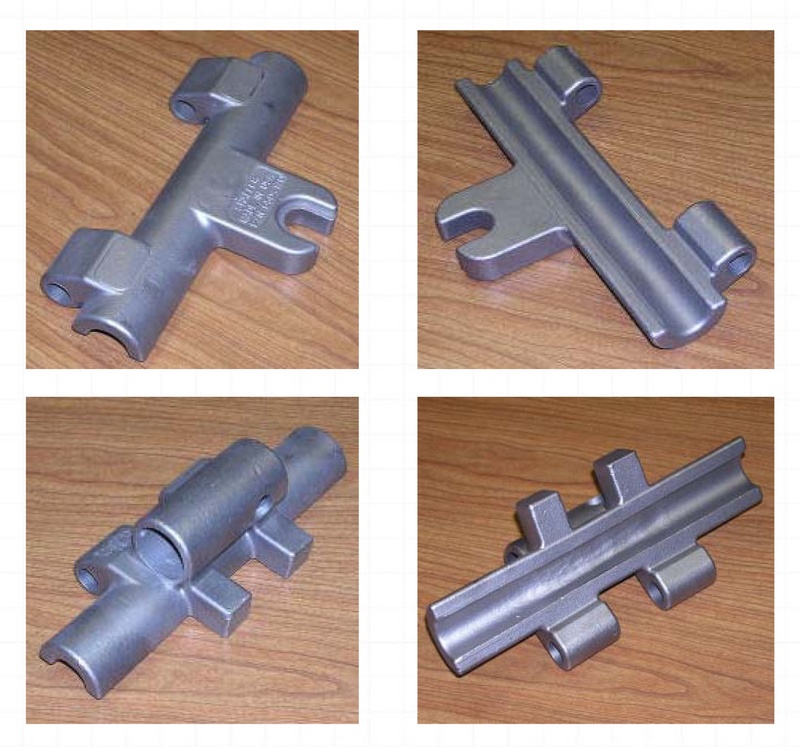 Engineers at both companies worked together to produce drawings for the production of investment castings and finish machining of the cable clamp assembly. After initial drawings were delivered, the two companies collaborated to optimize tolerances, minimize machining and maximize cost effectiveness while maintaining the integrity of the part. Once all parties came to an agreement on the designs, Eagle Precision began the process of ordering tools and machining fixtures. 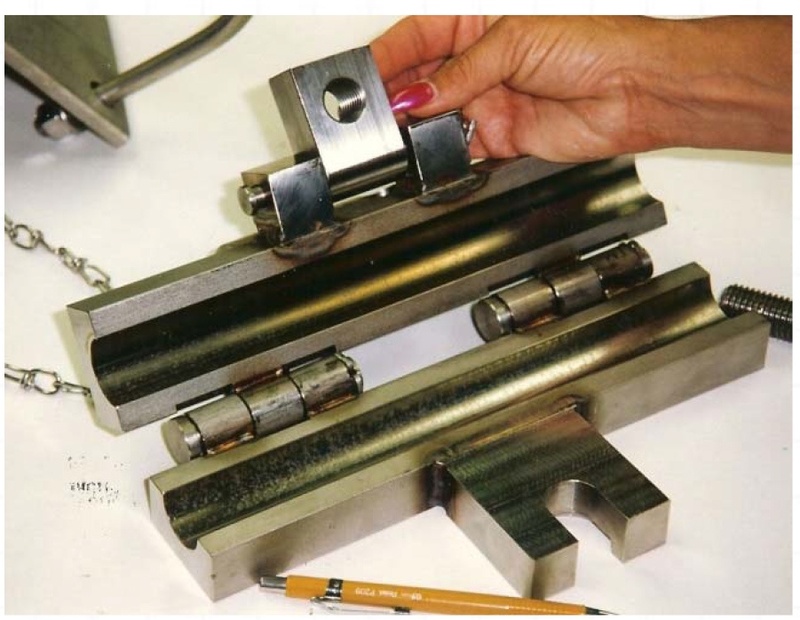 They provided a lump-sum estimate that included the costs of delivering four wax tools (one for each component of the part to be cast) and machining fixtures, and estimated a lead time of 10 weeks for their delivery. The two companies also worked together to determine the optimal material to use in the casting, which was Alloy 316 stainless steel. All components of the assembly, including accessories, would be cast using this alloy. At this point, Eagle Precision Cast Parts was comfortably able to provide a per-part cost projection, based on a minimum of 200 assemblies in a batch. The client could clearly see that, as promised, the conversion to casting would save a significant amount of money. After the client’s go-ahead, Eagle Precision ordered the tools and cast the parts. The intricacy of the cable clamp assembly required that four castings would be made and later assembled into a finished part. Eagle Precision worked with their sister company, Eagle CNC Technologies, to ensure quality machining on all parts. They ordered machining on all critical areas of the assembly where tolerances could not be held by the casting process itself. Eagle Precision also assembled the cable clamps in-house, in order to deliver a product ready for sale. In this case, Eagle Precision’s original predictions about the advantages of casting proved true. In fact, they were able to complete the first production run well within the original outlined schedule. Most importantly, they were able to produce a less expensive, stronger and more aesthetically pleasing part with faster, more consistent lead times. Initial demand led to casting 5,000 – 6,000 parts per year, and the casting conversion saved the client over $100 per part, resulting in higher profit margins. Aesthetic and structural improvements to the parts also increased their resale value. Eagle Precision continues to produce this part today, though ownership of the client company has changed hands.